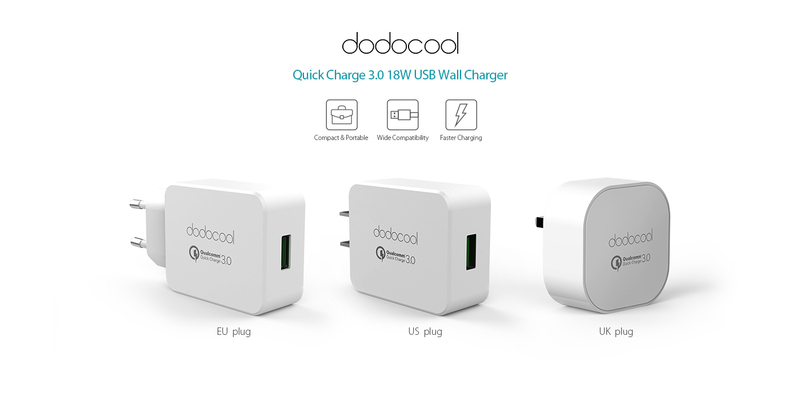 dodocool Quick Charge 3.0 USB Wall Charger adopts the latest charging technology. 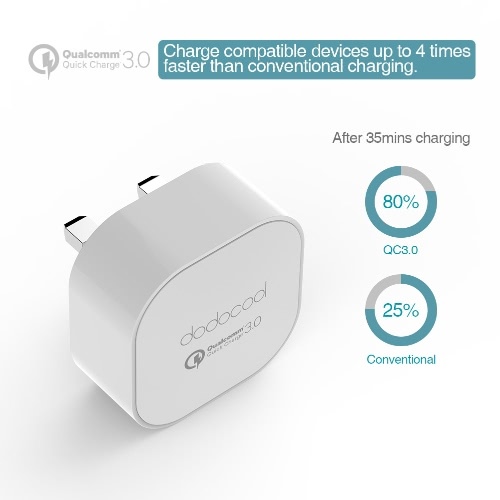 For QC3.0 enabled Android devices, charging rate is up to 4X faster than conventional chargers, up to 27% faster and up to 38% more efficient over Quick Charge 2.0. 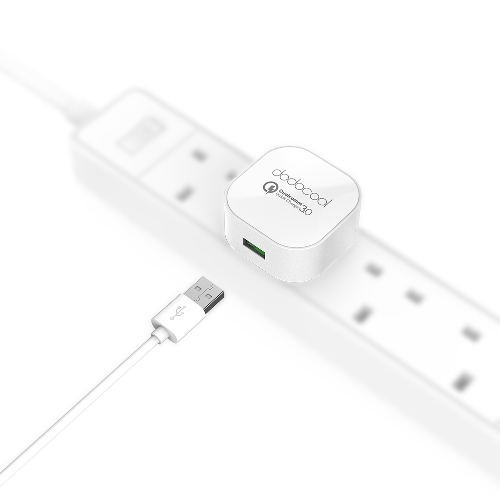 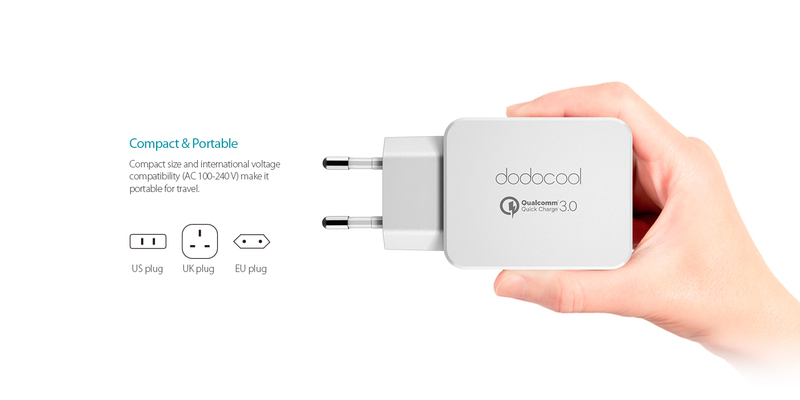 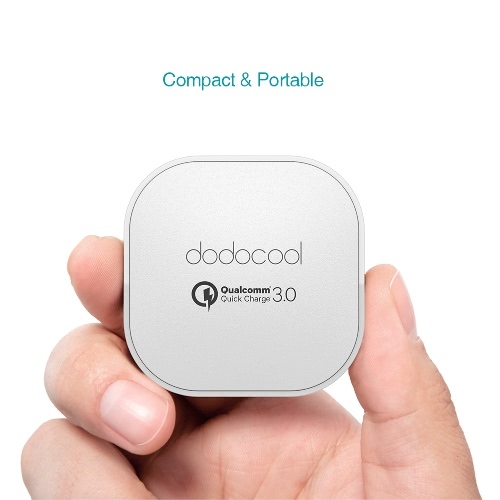 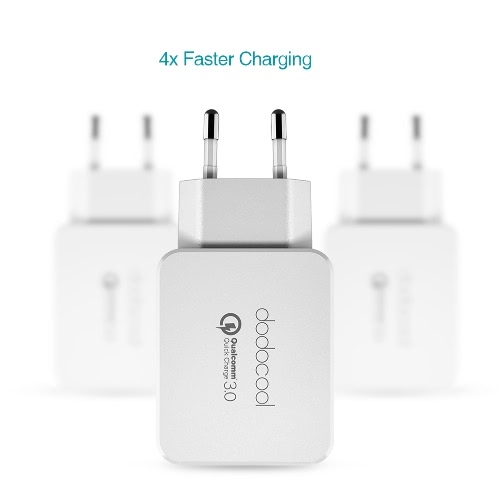 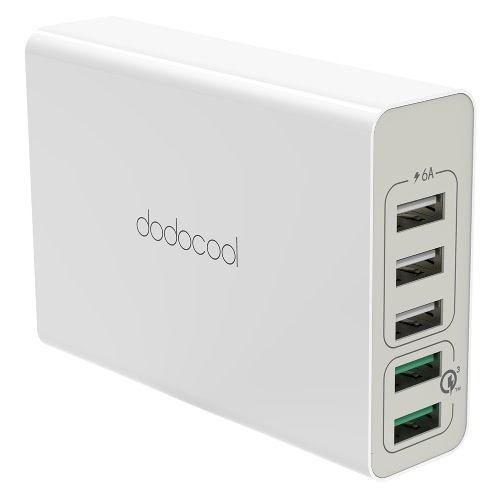 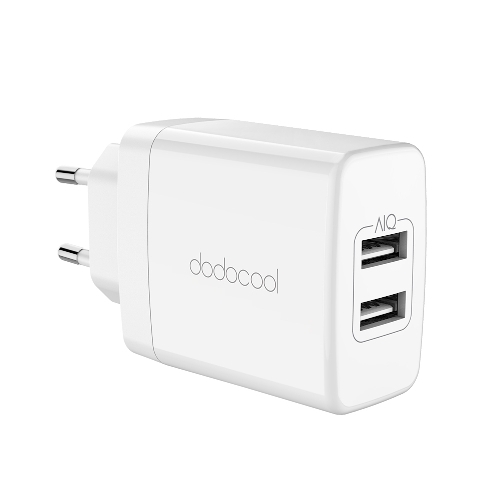 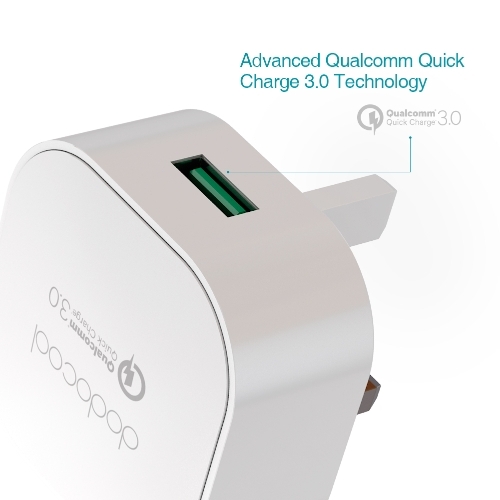 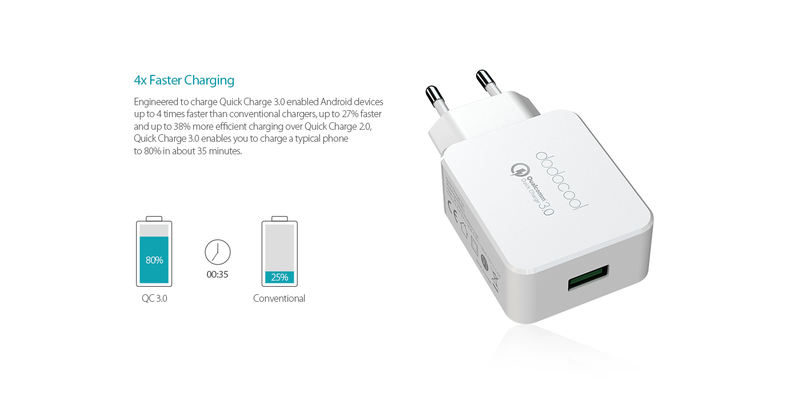 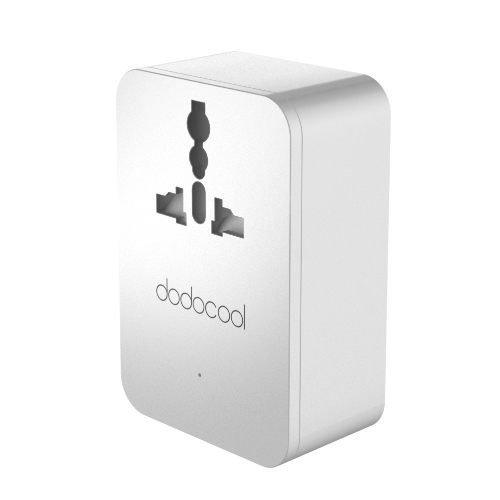 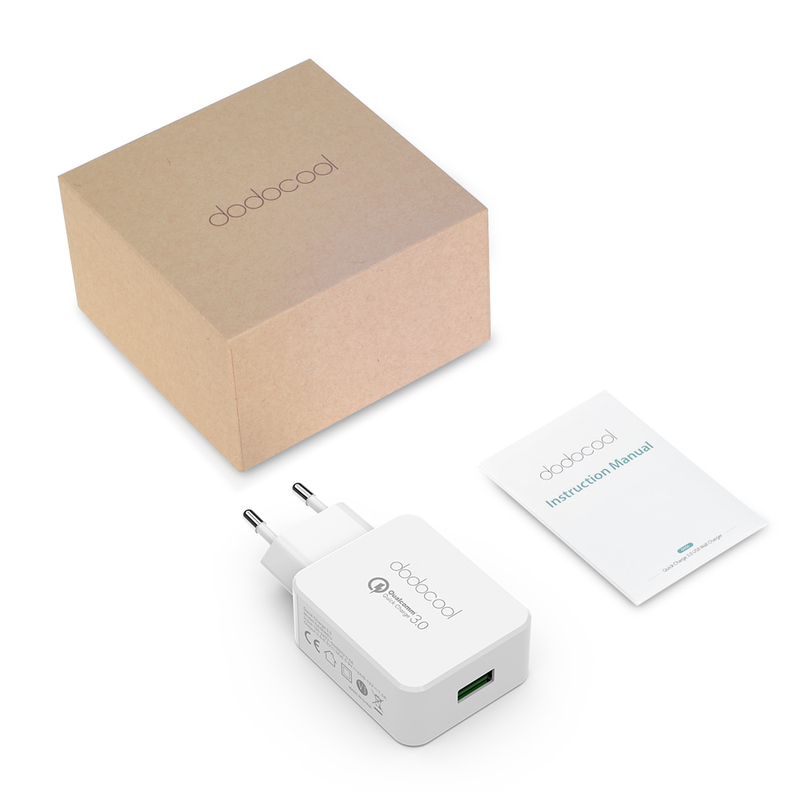 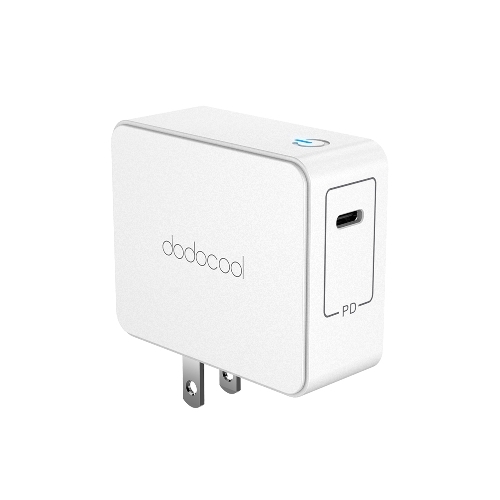 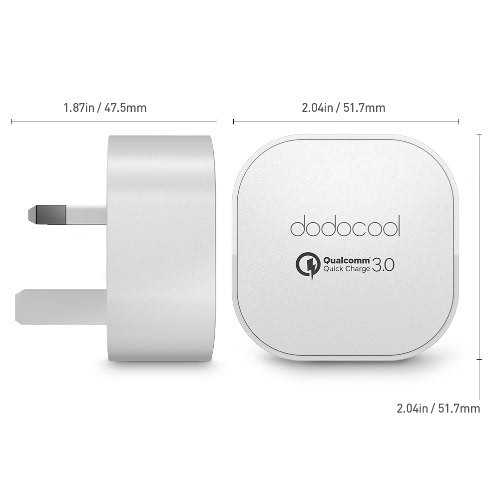 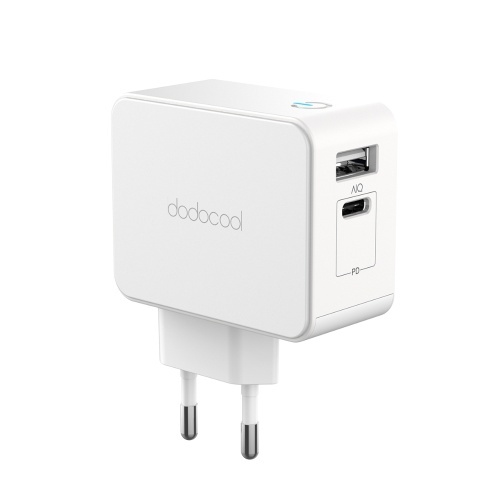 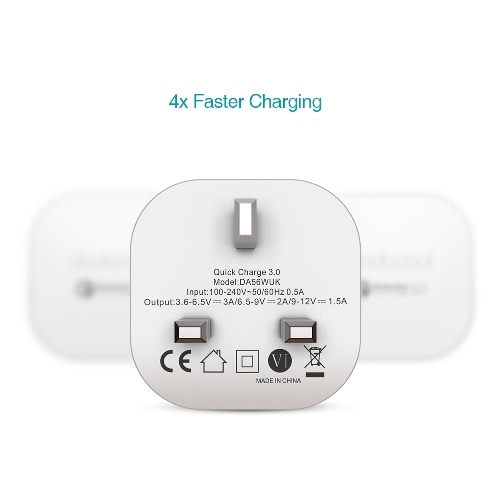 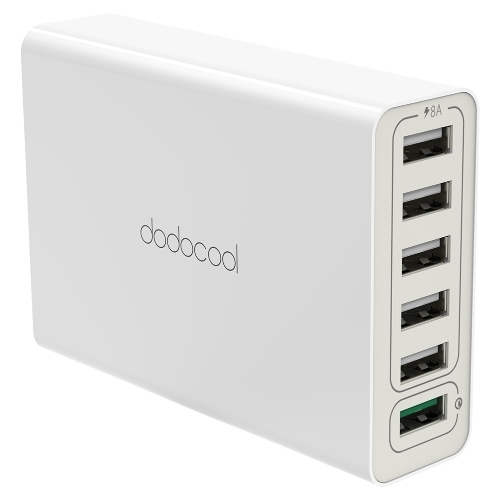 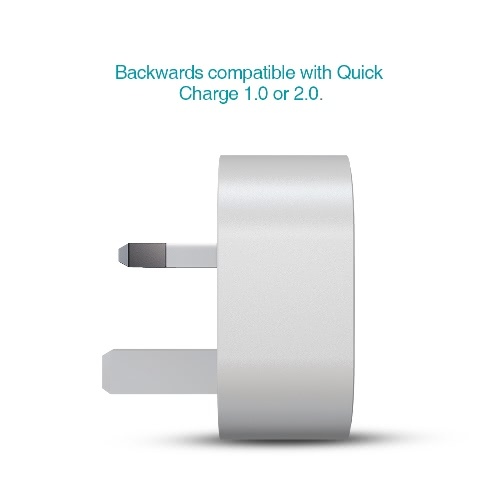 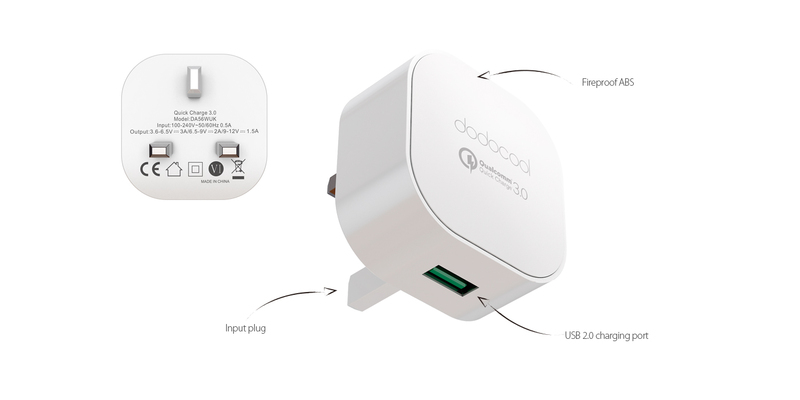 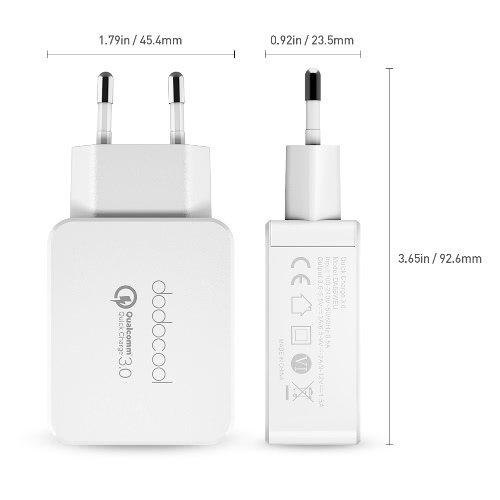 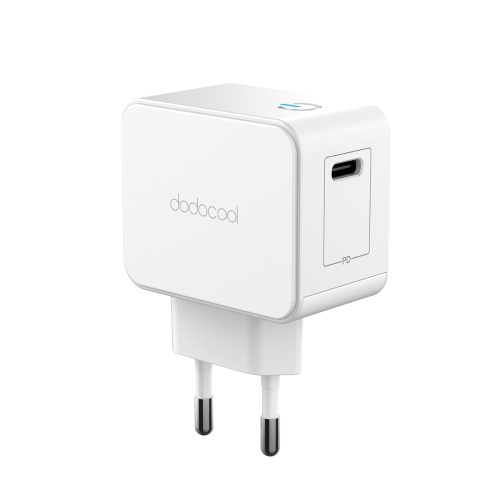 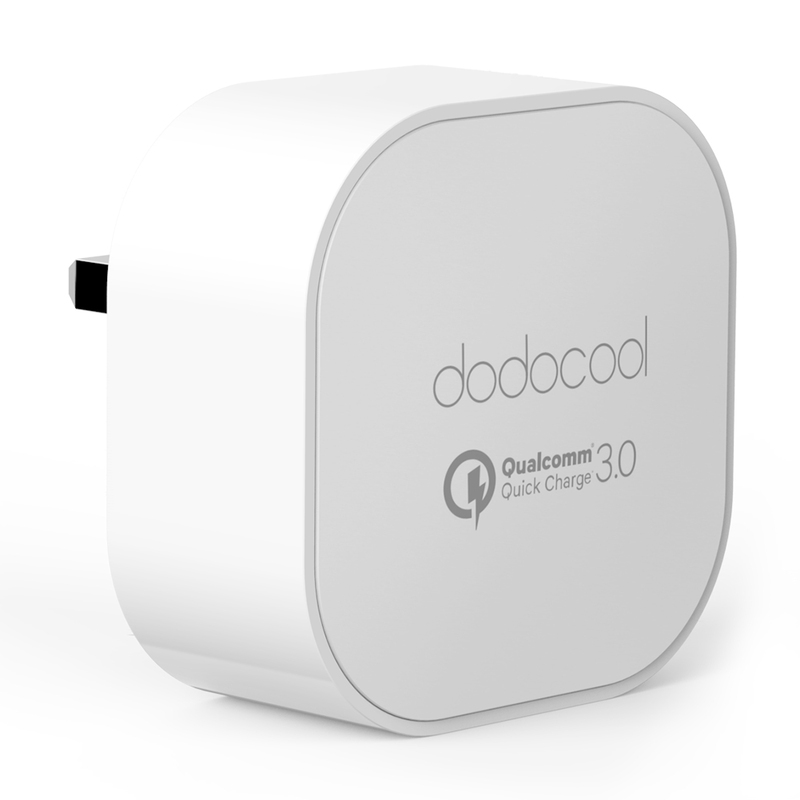 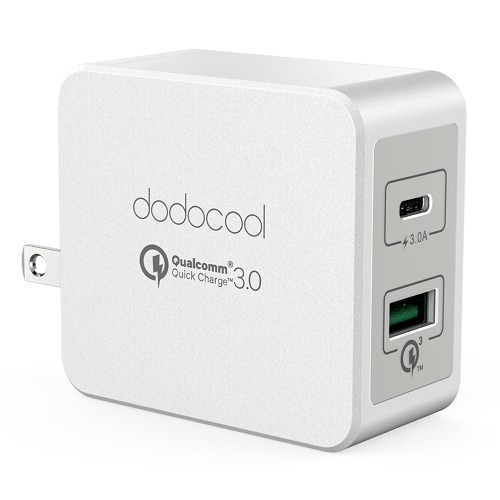 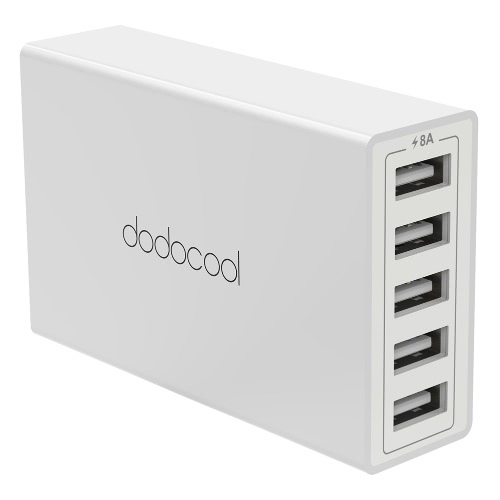 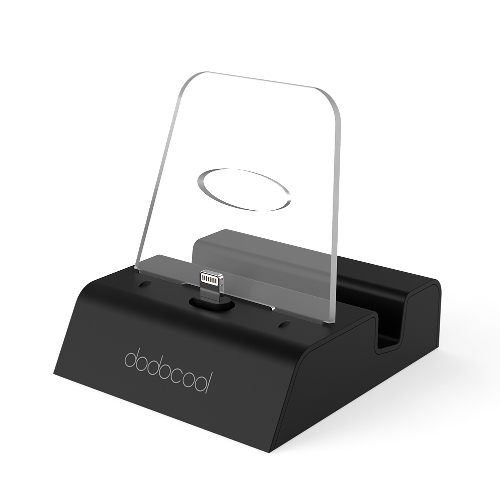 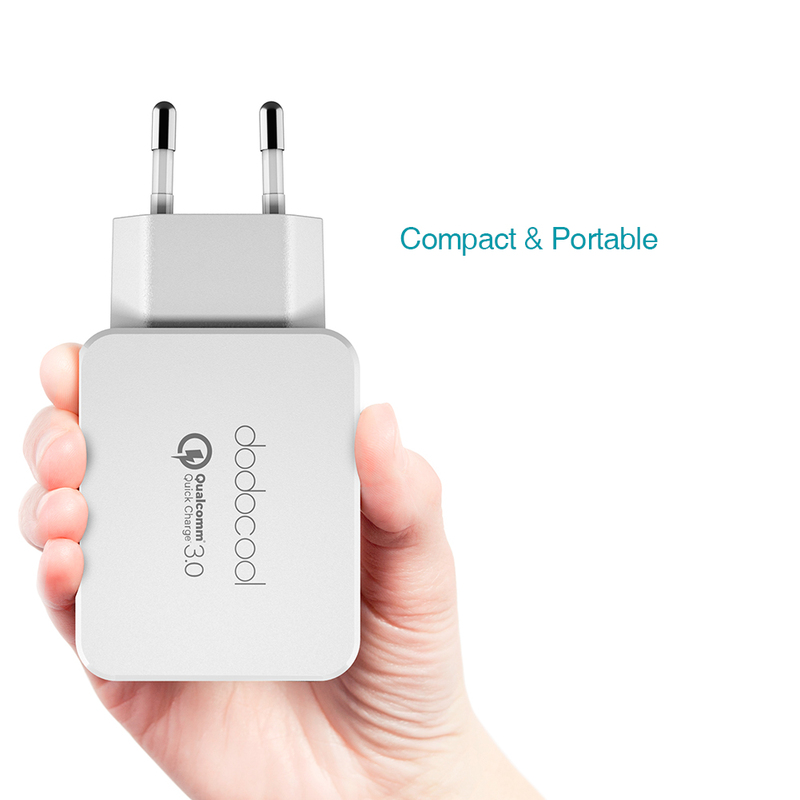 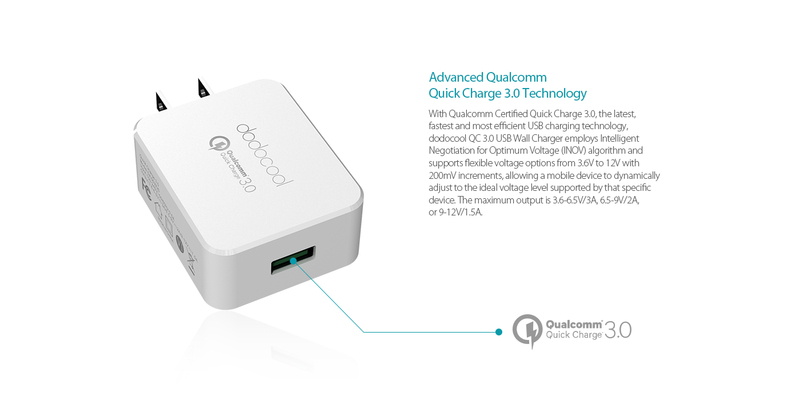 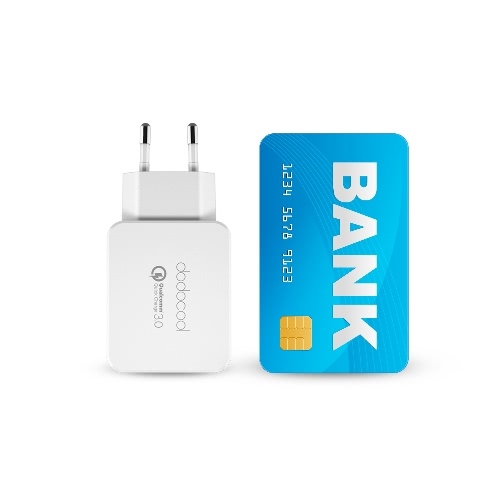 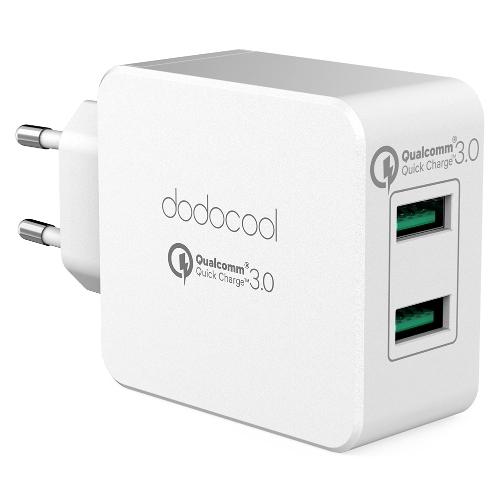 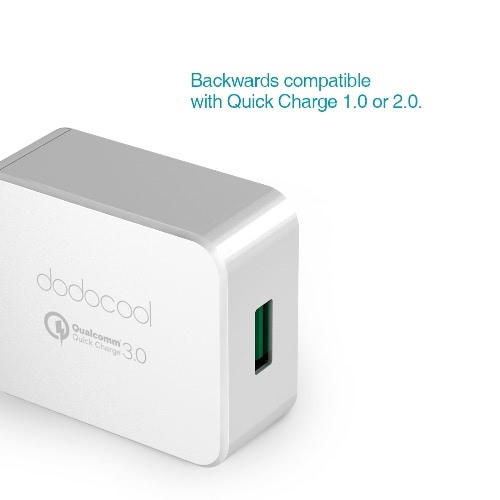 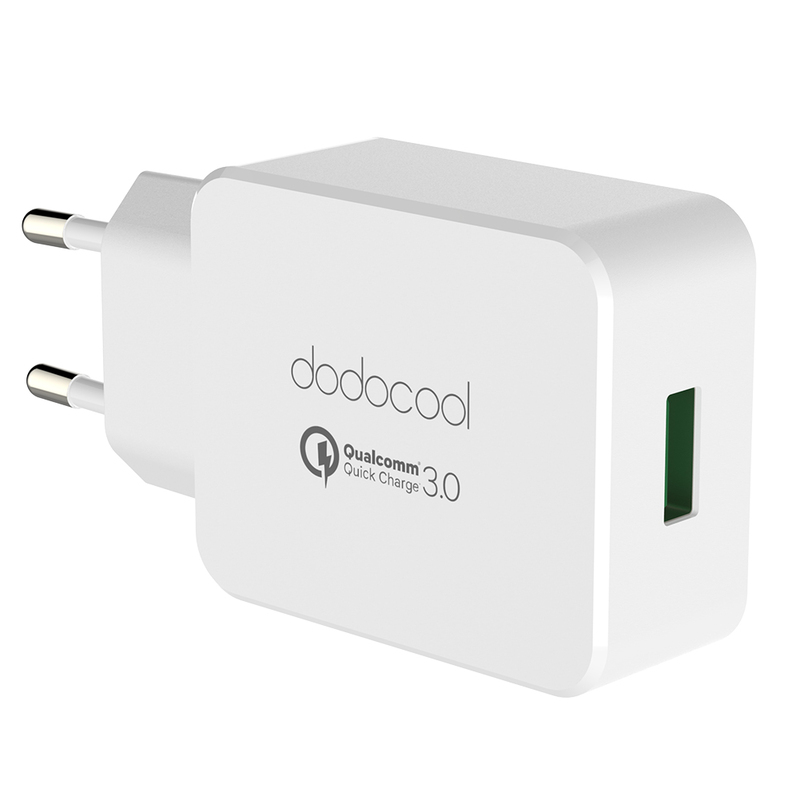 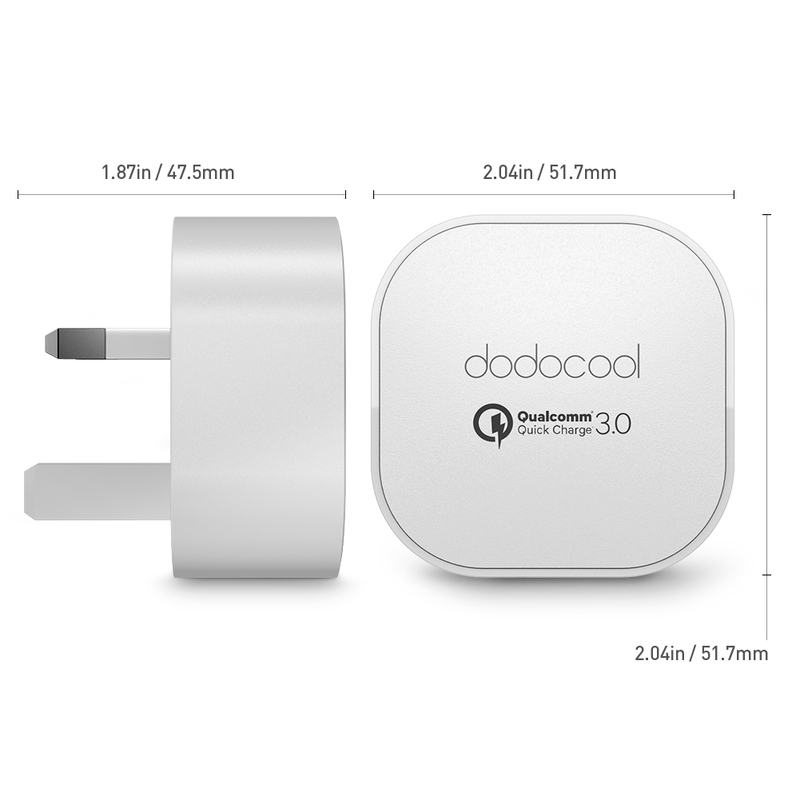 With Qualcomm Certified Quick Charge 3.0, the latest, fastest and most efficient USB charging technology, dodocool QC 3.0 USB Wall Charger employs Intelligent Negotiation for Optimum Voltage (INOV) algorithm and supports flexible voltage options from 3.6V to 12V with 200mV increments, allowing a mobile device to dynamically adjust to the ideal voltage level supported by that specific device. The maximum output is 3.6-6.5V/3A, 6.5-9V/2A, or 9-12V/1.5A. 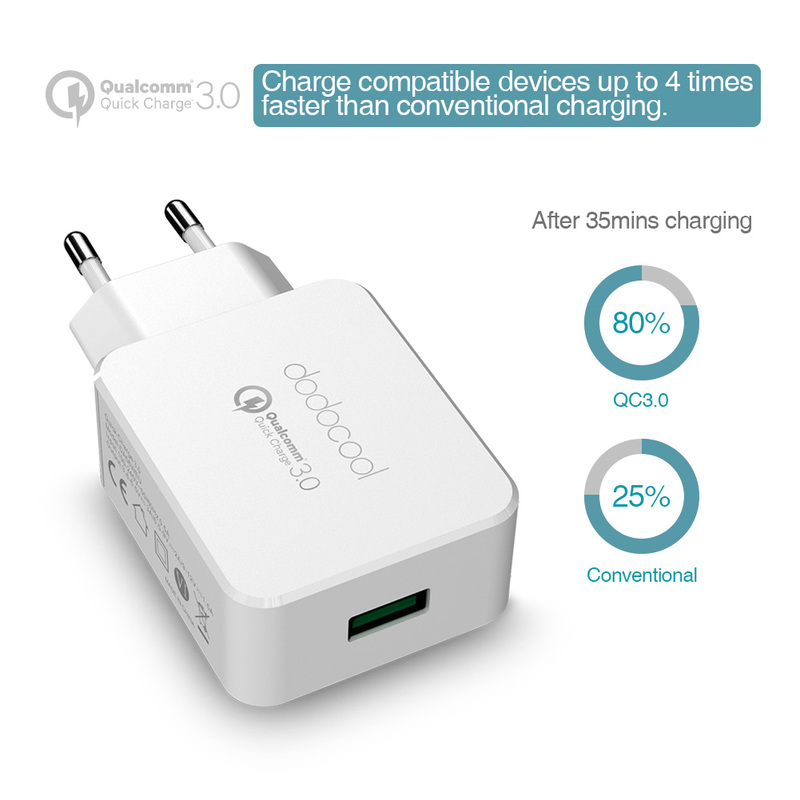 Engineered to charge Quick Charge 3.0 enabled Android devices up to 4X faster than conventional chargers, up to 27% faster and up to 38% more efficient charging over Quick Charge 2.0. 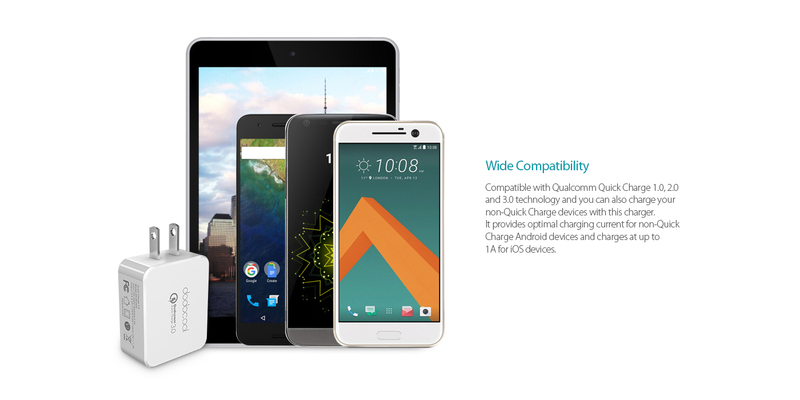 Quick Charge 3.0 enables you to charge a typical phone to 80% in about 35 minutes. Compatible with Qualcomm Quick Charge 1.0, 2.0 and 3.0 technology and you can also charge your non-Quick Charge devices with this charger. 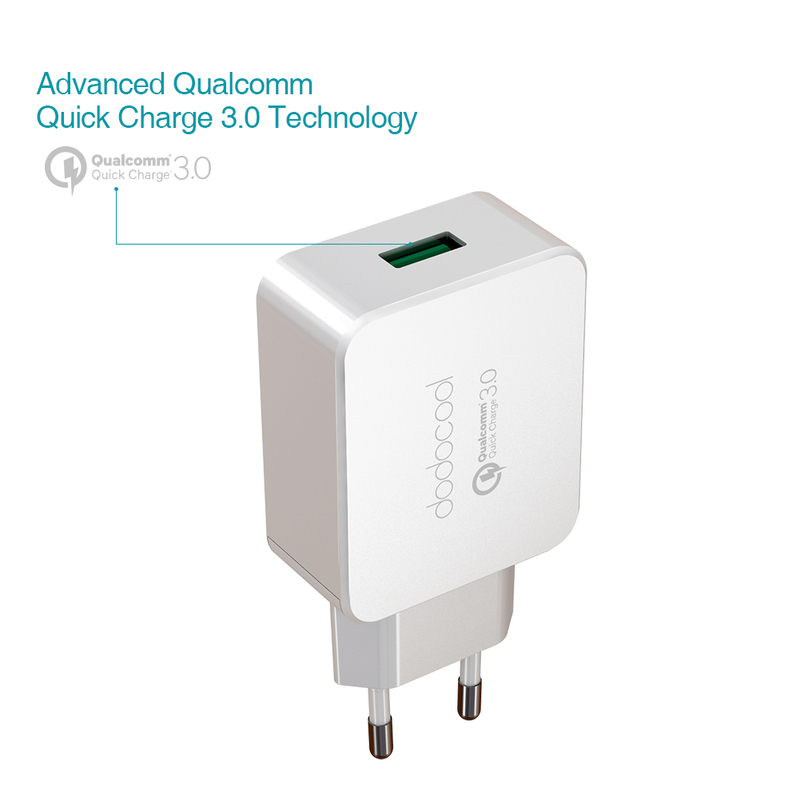 It provides optimal charging current for non-Quick Charge Android devices and charges at up to 1A for iOS devices. 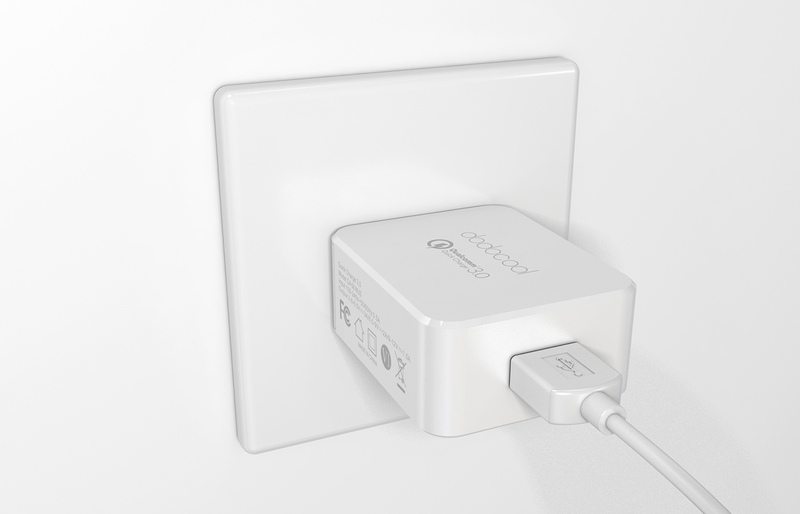 CE, FCC, RoHS certified. 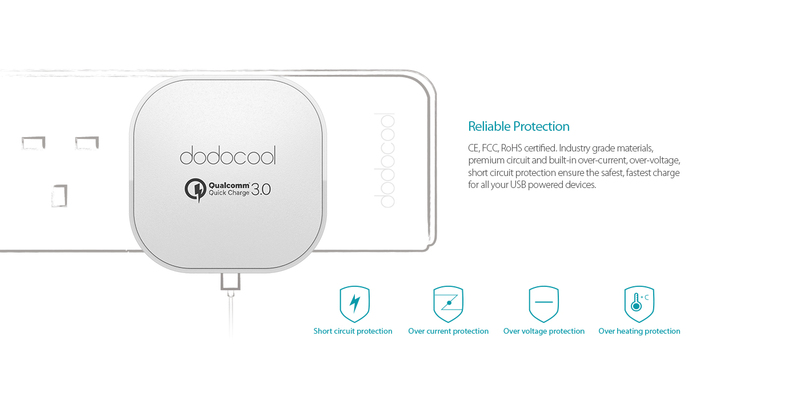 Industry grade materials, premium circuit and built-in over-current, over-voltage, short circuit protection ensure the safest, fastest charge for all your USB powered devices. 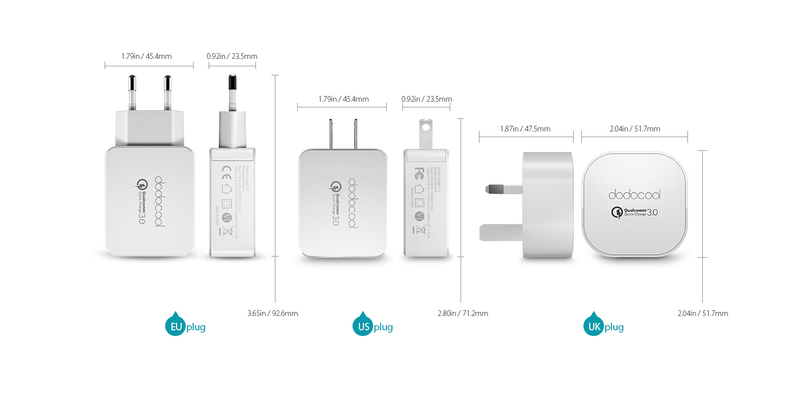 Meets new energy efficiency requirements of DOE Level VI which is the highest energy efficiency rating. 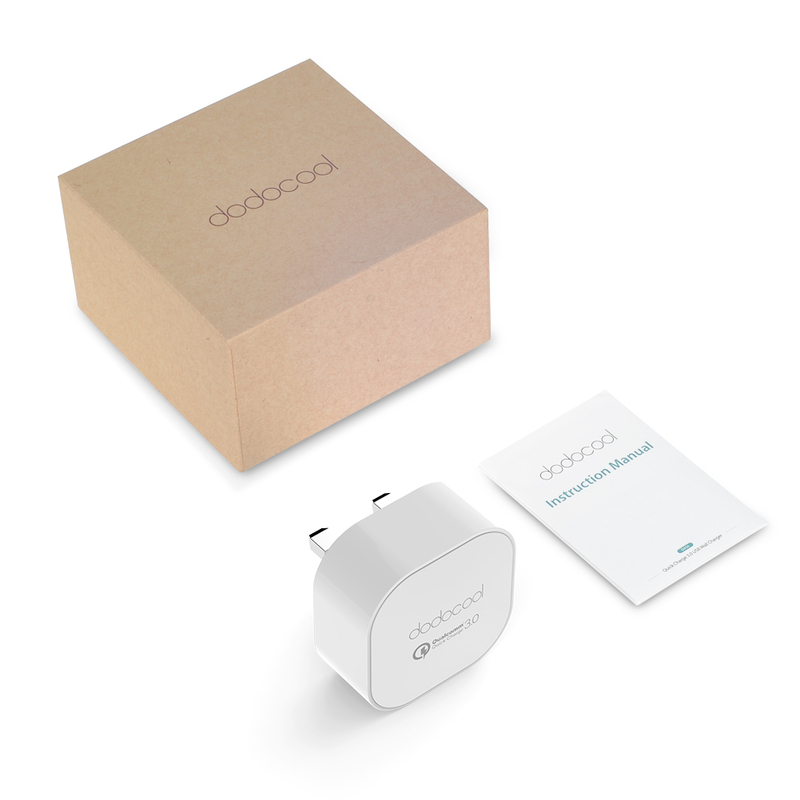 dodocool offers an 18-month warranty and friendly customer service to assure your long term enjoyment.